Pearl Malkin, 89, is hoping to raise $3,500 on Kickstarter for her first startup, Happy Canes, a line of walking sticks decorated with artificial flowers. Think you're too old to become an entrepreneur? Don't say that to 89-year-old Pearl Malkin, aka "Grandma Pearl." 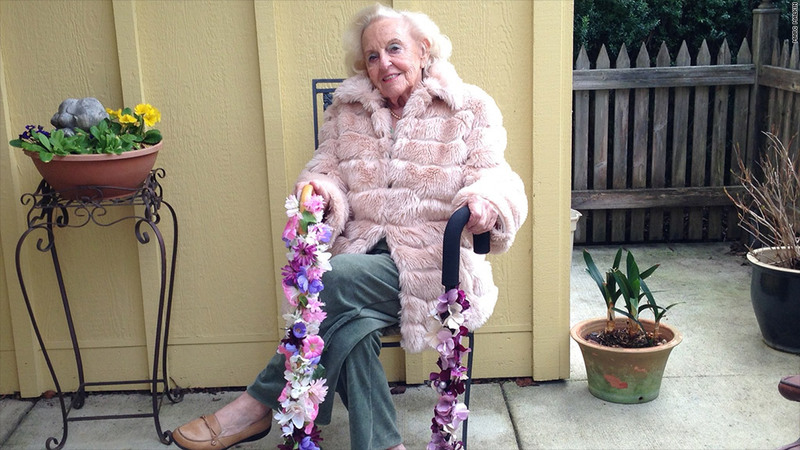 The spunky grandmother has launched a Kickstarter campaign to raise $3,500 in startup capital to help produce her Happy Canes, a line of walking sticks she decorates with artificial flowers. Malkin is more than halfway to her funding target, having raised $1,856 from 71 backers so far. To get the money, she'll have to raise at least $3,500 by the March 23 deadline. Even if she doesn't get there, "this is still so exciting for me," she said. "All my life my mother told me that I couldn't do anything right," said Malkin. "But I'm doing something right with this." Malkin started making her bright walking sticks four months ago. Bored with her plain black cane, she decided to glue on a few flowers. Soon she'd created different canes to match different outfits. When a close family friend, Adam London, visited, he suggested she turn the canes into a small business. London, an aspiring entrepreneur himself, told Malkin about Kickstarter and Etsy, an online marketplace for handcrafted goods, and set her up on both sites in January. The canes sell for $60 on Etsy. If her business takes off, Malkin hopes to line up some additional help so she can make 10 to 20 Happy Canes a day. It takes her about 40 minutes to glue on the flowers, which she buys from crafts shops. She purchases the canes from local Goodwill stores. She also plans to develop seasonal collections. Her spring line, for example, will use tulips, lilies, daffodils and gardenias. "All of my canes will be made to order," she said. Why start a business now? The self-proclaimed rebel said she "can't sit idle and watch boring TV all day long." And while she's not launching the firm only for the money, some extra income would help. Malkin lives alone on a shoestring budget in a San Rafael, Calif., retirement community, said her son Marc Malkin. "My father left her some money when he passed but she lost a lot of it in the tech crash," he said. Marc and his two brothers pitch in, too. Still, rent on Grandma Pearl's small cottage takes up $400 of her $1,000 monthly Social Security check, leaving her only about $600 a month to live on. Malkin has found creative ways to add to her retirement income before. Five years ago, Malkin took on a $50-an-hour gig as a standup comic at a local restaurant. "The older crowd wanted dirty jokes. I don't tell dirty jokes, so I stopped," she said. Now, she added, "I want to make people happy, spread a little cheer around and maybe buy some nice shoes again." Malkin is trying to entice investors with some interesting incentives. Pledge $22 and you get a signed copy of "A Jewish Mother's Guide to Professional Worry," a biography of Grandma Pearl that was written by another son, Steve Malkin. Pledge $90 and you receive the book and a Happy Cane. One investor has pledged $500, and will get a cane-decorating lesson and a home-cooked, four-course lunch. "For $500, I would lay myself on the table with a fork!" she quips. "Ok, maybe stuffed cabbage and chicken matzo ball soup." Are you 70 or older and trying to start a business? E-mail parija.bhatnagar@turner.com and you could be featured in an upcoming article.